Fortunately, burglaries are a well-studied phenomenon — especially by law enforcement. • 50% of burglars will be deterred if your home has some sort of video monitoring system. A thief doesn’t want his face on YouTube! • Unfortunately, signs and window stickers warning of an alarm system do not deter thieves. However, 62% of burglars will immediately run away when an alarm goes off. Always turn on your alarm system when you’re not home! 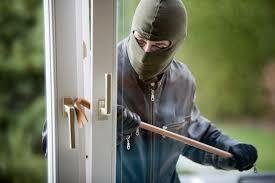 • 22% of burglaries occur through a sliding glass door or patio door. Make sure it’s locked and also use a solid metal jammer. • Some thieves use frequency scanners to gain access to garages. Police recommend changing your remote entry code regularly and putting blinds or curtains on garage windows so thieves can’t see (and be tempted by) any valuables inside.